Over the last year or two, the climate for job searching has changed radically. The more traditional methods of finding employment (scanning job boards, applying to online postings, sending résumés to companies, etc.) are no longer considered to be very effective by most people. It seems that everywhere you look for advice, job-seekers are hearing that magic word, “networking” as the answer to how to find a job in today’s challenging market. As a recruiter who regularly advises job-seekers, the question I’ve been getting more and more is: “Exactly how do I network?” To put it another way: “What are the steps I should go through to effectively search for a job using ‘networking? '” It seems like an obvious question, but finding a clear answer is not so easy. 1) Building Your Target Company List. 2) Identifying the Key People in Your Target Companies. 3) Reaching Out to Your Targeted People. 4) Talking / Meeting With Your Targets. 5) Following-Up and Staying in Touch With Your Network. I’ve already written about some of these steps in great detail in former blog entries. In those areas, I will simply point you back to the prior blogs. You may also want to start by reading “Looking for Networking in All the Wrong Places” for an overview of the wrong vs. the right ways to network. Effective networking begins with creating a target list of companies likely to have jobs you are interested in based on your particular industry and specific job function, and then focusing your networking activities on reaching the decision-makers in those companies. Making this list for yourself is a critical first step, and it should become your road-map for moving forward with your job search. The process starts with some soul-searching. What are you actually qualified for, based on your past work experiences? Exactly what type of job are you looking for? What is your industry niche? What is your particular area of expertise? What job function makes the most sense as a next step for you? Answering those basic questions is easy for some, and confusing and difficult for others. However, figuring those things out determines everything else that follows. Only you know what you are experienced at, and what you are truly qualified for. If you cannot answer those questions easily, then it may be time for some serious career counseling. Pursuing jobs that you are really not qualified for can be a huge waste of time for many people, including the people you might network with in that pursuit. For now, I will assume that you know what industry niche and job function your background and skills logically lead you to … what positions you are clearly qualified for based on your experience. You should also consider things like how far you’d be willing to commute every day, what size company you’d be comfortable in, etc. The more you can narrow down exactly what type of position you’d be most qualified for, and exactly what type of company you’d like to work at where such a job exists, the more effective your targeted networking is likely to be. The key is to narrow your focus as specifically as possible. Once you’ve answered those questions for yourself, you are ready to identify companies in your geographic area that might have jobs that fit you. (If you are considering relocating, you can repeat this process with different locations to assemble multiple target lists.) Now you need to do some research. My advice is to use a professional business database like Dun & Bradstreet’s Million Dollar Database Premier or ReferenceUSA Business. Anyone with a public library card number can log into those databases from any home computer! (Ask your local librarian for help if you don’t know how to do this.) This gives you access to full information on millions of companies, including every business in the U.S. and the leading businesses in Canada. Use the advanced search mode to generate a list of companies that are the most likely to have jobs like the one you think you fit. To do that, put in search criteria that fit your profile. Company look-ups can contain multiple search criteria, including location by zip or area code, industry, size, products, number of employees, revenue, and specialty fields. Try using keywords specific to your niche. Keep narrowing the search criteria until you get the list to under 100 results. If this is your first search, I’d say to go even further and narrow it closer to 50. (You can always go back later and widen this list to get more targets if you exhaust your first list.) Print out the list and look it over carefully. You can probably eliminate quite a few companies based on things you already know – places that you’ve heard bad things about, places that you know are in financial trouble or any number of other personal red flags. Simply cross those places off the list. What’s left is your first target list! Next is the task of identifying people in the companies on your target list that you want to reach out to. For each company, you’ll want to start a separate list for yourself of the key people you identify, and devise a way to keep track of what actions you take with each of those target people (e.g. sent intro email, left voice-mail message, spoke with on the phone, met with, followed-up with, etc.) You can do this with an Excel spreadsheet, a Word document, or using simple paper and pencil. Whatever works best for you. The key is to stay organized, and to remember who you’ve contacted (how & when), what the results were, and what the next step is for each target person. The people most valuable to you are those that 1) work in the area of the company that your potential job would be in; 2) actually do the job you want to have; or 3) hire and supervise the people who do the job you want – otherwise known as “decision-makers!” Obviously, #3 above is your ultimate goal. Numbers 1 and 2 can potentially lead you to #3. Figuring out who these people are, and how to contact them (email addresses, phone numbers, LinkedIn Profiles, etc.) can be very time-consuming … and can be done using many different methods. I would suggest concentrating on one company at a time, and then skipping to step 3 below (reaching out.) Then return to this step for the next company, and so on. The first place to look is in the information that your original database search returned, which often includes company contact information, decision-maker names, executive biographies, and more. LinkedIn would be the next place to look. Do an advanced search for anyone who works at one of your target companies. Limit the results to people who are local to you, and who work in your niche (using either keywords, or job titles.) People you’ll find using the LinkedIn People Search will either be connected to you directly (1st degree), connected to one of your direct connections (2nd degree), connected to someone else who is connected to one of your direct connections (3rd degree) or will share mutual LinkedIn Group Memberships with you. Many people on LinkedIn are not connected to you at all … however, you can only send LinkedIn messages to people that are connected to you in some way. Therefore, it is in your best interest to join as many LinkedIn Groups as you can. (Their limit is 50.) Join groups likely to be of interest to your industry. The more members a group has, the more likely you’ll snag contacts in your target list. If you go the the Groups screen and click on “Find a Group” and then “Search” the groups using keywords, the results will be ordered by membership size with the largest groups at the top. (Each group will have the number of members listed below it’s description.) Try using your city as a keyword to find locally based groups. Try adding terms specific to your niche to limit it to groups that your target people would be most likely to have joined. Another trick is to examine the profiles of people who you’ve already identified as key targets, and look to see what groups they are members of. Then simply request to join those groups. It sometimes takes a day or two to get “approved” … but almost every LinkedIn group approves all membership requests. A personal referral from someone you actually know to a real decision-maker in one of your target companies is the “Holy Grail” of this kind of networking. (The next best thing would be a referral to someone else who knows the decision-maker and can potentially refer you after you meet with them.) If you are able to contact a decision-maker with the intro statement: “I just met with a mutual friend of ours, Joe Shmoe, and he spoke very highly of you and suggested that I reach out to you …” then your chances of scoring a meeting with that person are very high. This type of direct referral should always be a goal that you keep in the back of your mind as you go through these steps. If you happen to spot one of your target people on LinkedIn that is connected to someone else you know, then the most obvious thing for you to do is reach out to your 1st degree connection and ask them to refer or introduce you to the target. Of course, that only works if you actually know the person you are connected to, and that person actually knows your target. You cannot assume that every LinkedIn member actually knows every person on their own contact list. Many people accept invitations to connect from people they don’t actually know very well, or at all! The only way to find out is to ask, and you have nothing to lose by trying. Finally, show your target company list to literally everyone you know: family, friends, neighbors, business associates, clients, former customers, school alumni, church/synagogue members, etc. Ask everyone if they know anyone who works at those companies – especially in your specific niche area of those companies. If someone you know gives you a referral, ask for a phone number and an email address … and ask if you can use the referring person’s name when you contact them. Now that you have your target company list, and you’ve identified people at those companies that you want to network with, it’s time to actually contact those people. This is a step that I’ve already described in a previous post. Read “Targeted Networking: How to Effectively Reach Out.” In that posting, you’ll find details on my two-step method for approaching specific people you’ve already identified on your target list, with the goal of setting up a meeting with them. This involves 1) an intro email, and then 2) a follow-up phone call. I’ve even provided a sample email template that anyone can adapt and use. OK, so you’ve reached out to your targets, and some have responded to you with invitations to talk – either by phone, or in person. Naturally, a face-to-face meeting is preferable and WAY more effective than a phone conversation. However, many people are simply too busy to want to meet with you in person … so you take what you can get! If they do agree to meet you in person, you should suggest meeting for coffee – or in some other informal setting. So, exactly what should your goal be for this conversation or meeting? First, let’s talk about what you should NOT be doing. You should NOT start by giving the person your résumé (unless they specifically ask for it.) You should NOT ask for a job. You should NOT ask the person if their company is hiring, and then ask them to help you get in front of the hiring manager. All of those hard-sell approaches will turn people off faster than a sleazy used car salesperson! They’ll feel put on the spot and taken advantage of, and they’ll immediately regret having agreed to talk with you! Instead, the approach should be the classic networking tactic: “Since you are an expert in your field, I’d like to find out more about your background and experiences, and ask for your career advice and help.” Flattering the person and simply asking for their advice and expertise is much more likely to score you points than sounding like a desperate job-seeker. The goal of any networking meeting with a person from your target list is very simple: you want them to get to know you and vice-versa – in an informal way. This is not an interview. It’s a conversation with a potential networking partner. You should ask to hear more about their background. You want to learn more about their industry, their job, their company. You should wait until the person asks about you, and then tell them your story. In doing so, you’ll want to be brief, and hit the highlights of your experiences and areas of expertise. You should clearly describe what type of position you are hoping to uncover through your networking activities. You also want to make clear that while you are, indeed “in transition” … you don’t expect that person to have a job for you. Rather, you hope that person can give you some expert advice – perhaps point you in the right direction, or suggest other people they might recommend you talk with. Most decision-makers you’ll network with won’t have a job for you that day. Again, your goal should be to simply have them get to know and remember you. Show them your target list. They might know of an opening at another company, or be able to refer you to someone else at another target company on your list. Or perhaps they’ll hear about a job elsewhere later, or a job will open up in their own company tomorrow, or next week, or next month. You want them to know who you are, and most importantly to LIKE YOU and REMEMBER YOU! It’s all about being in front of the right person at the right time. One more very important point about meetings: while it will be obvious that as the job-seeker, you have much more to gain from this networking meeting than the other person, you should still attempt to offer to help your target. Networking only works when both parties feel they are getting something out of the partnership – that it’s truly a 2-way street. Read “The Art of Giving: the Key to Effective Networking” for more on this essential concept, and for suggestions on specific ways that you can actually offer to help a target. Don’t make the all-too-common mistake of taking without giving. One-way partnerships usually don’t work very well. As suggested above in Step #2, you need to keep careful records on everyone you talk or meet with from your target list. The first thing you should do is write a thank-you email immediately after a first networking conversation or meeting. (Some people recommend sending an old-fashioned hand-written thank-you note to stand out from the crowd. While there’s certainly nothing wrong with doing that, I say send an email first because it is so immediate – and it also puts your contact information in their email inbox where they can easily find you later.) Then, you need to remain in touch on a regular basis. You’ll need to set yourself reminders (perhaps on your calendar) to not forget to follow-up regularly with each and every networking contact you connect with on your target list. There’s nothing more disappointing than having a great networking meeting that lacks any follow-up. It’s kind of like having a first date where you think you really clicked with the other person, but then you never hear from them again! The onus is all on you here – don’t drop the ball. If you want your targets to remember and help you, you must make the effort to stay in touch! I try to send an individual follow-up email to each of my target contacts at least once a month. (Mass emails to a large list of addresses is a big no-no … send each person an individual email, and add a personal comment to each one if possible.) Follow-up emails should include any updates on your job-seeking activities, a list of every significant meeting that you’ve had since your last email, and a reminder that you are still “in transition.” It’s especially important to let a contact know if you meet with someone they specifically referred you to – and thank them profusely for that referral. This entire process is a long-term strategy that can be very time-consuming, and it may not produce quick results (i.e. a job.) It will, however, position you well for long-term success in today’s highly competitive job market. Entry filed under: Advice for Job Seekers. Tags: job-seekers, LinkedIn, networking, unemployment. Mike – As usual, a great article – especially so, because I agree with all that you have said. Networking is, of course, a huge subject. And it takes a great deal more actual effort – but is far more interesting – than the old crank-out-the-resumes approach. Far greater likelihood of success too. I want to reinforce the notion that THIS STUFF TAKES TIME. Everything from deciding your future (no small thing) to building the list of companies, finding contacts, etc. – all this takes time. Be patient and be ready to work and invest the time needed to do this right. It will pay off. Hi Michael – thanks for the mention in your blog – we committed in 2009, and will carry through to the new year, to share with our library clients and their patrons, the ways to use the data in ReferenceUSA as a career search tool. Your point is an important one – identify the universe of potential employers – our seminars dig even deeper into building a marketing and networking strategy. The best part is that we continue to hear success stories back from the front lines. Keep up the good work and best wishes for the new year! I have been in Talent Acquisition and Outside Sales B2B in the employment industry for a plethora of years and found your articles to be right on target. I wish you continued success in your career endeavors in 2010. As a current job-seeker and former Recruiter myself, there are quite a number of excellent observations you’ve made in your articles / blog here over the past few weeks. Very helpful. Thanks for taking the time to put it all together. Mike-great post, as usual. I was laid off on September 30th and was offered a job with a great company last Friday, I am accepting it tomorrow. I would not have been able to do this without my network. However when I was working I did what a lot of us do when we are employed, I let my network slide. Weekends were for recuperating and lunch at work was for wasting time with co-workers, not calling old contacts. BIG MISTAKE. It was through sheer determination that I built it back up again and I can assure you this slide will not happen again. I believe in the job market we will see in the future where unemployment will be between 8%-10% for say the next 24 months keeping your network live and engaged with you WHILE YOU ARE EMPLOYED is one of the most critical things you can do and ultimately you never know who can help you so you can not be afraid to “cold call” someone who is a distant contact or may seem inconsequential. One of the people that helped me the most is a old trading partner of mine from Southern India, from half a world away he was networking for me and scored me several interviews. The good news is today it is easier to keep your network with you and engaged. This was excellent advice and really good reading. I sincerely appreciate your taking the time and energy for putting out such good stuff that reaches so many. The article was an important reminder to invest more effort into networking as one tends to slacken off, especially approaching the year-end. Thank you again! Michael, I found your information very helpful. I now understand more about the give and take of networking and as Carolyn said above how not to appear bothersome, but still stay in touch. Mike, I feel I have screamed this very same list from the rooftops to my job seekers, and they still don’t get it. So I am adding a link to your blog from my site for job seekers. Hopefully the way you explain it will help them get the message. This is great Mike, but what about people like me who are making a career change? That’s a valid question, and I’m afraid you’re not going to like my answer. This blog was not written for people who are attempting a career change – that would be a topic for a completely different article. The unfortunate truth is that in today’s market, it is incredibly challenging just to find a job that you are actually qualified for. The field is overcrowded with highly experienced candidates in every area. If your goal is to enter a new field and find a job for which you have no actual prior experience … well all I can say is good luck! You’ve just multiplied the size of your challenge many times over. Thank you Michael for your response. I agree it is going to be a major up hill battle, but time for me to move on from sales. Do you know of any blogs that do deal with this subject matter? I know there are many people out there looking , but my approach is to look for entry level positions. I have many skills along with my masters to offer a company. It will take a lot of work on my part. Michael – great work, as usual. I take a lot of pride in and satisfaction from helping folks I know who are in transition. Above all else I push them hard on the subject of networking as an effective job search strategy and often share with them articles, etc. I come across. In fact, I have been building a little repository of job search related information and articles and have several on networking. I will be going through everything I have complied on the networking topic and will be deleting several and replacing them with this one. BTW – I have been sharing many of your postings lately, always giving you high marks and encouraging them to visit your blog site, when doing so. Mike, your articles are right on target. Very, very helpful. I was out of work for 10 months and found a job, which I started in November. It’s a job that was not posted anywhere. I used to work with someone who works for my new company and he called me to say there might be an opening. He even went so far as to set up a lunch for me with my new boss. The rest is history. Being out of work for the first time in my career was interesting, frustrating, challenging, fun, and rewarding depending on the day. I am now volunteering at my Church and helping others in transition and plan on directing them to your blogs. In addition, I’m going to use a lot of the information you’ve written as a point of discussion with this group. Thanks for sharing such helpful information. It really is all about networking. Thank you. Did you find the 10-month gap hindered you during other interviews? Also, one thing I’ll be doing, as I realized how important it is to give back, is to help others with their job search-not everyone can write a resume, cover letter, etc. I found your article through LinkedIn.com and ended up skimming through your entire blog. I appreciate how detailed you were with your job-hunting advice. Very useful tool. Thank you! First and foremost, thank you for your blog. I can’t remember how I came across it; it may have been an article posted on twitter or LinkedIn. I have read several of your posts now, and found them extremely helpful, candid and encouraging. I’ve been on the job hunt for about a month and a half now, but I’m bracing myself to be here for a while. Any good advice is welcome. Hi Michael: As a past recruiter and current career advisor, I couldn’t stree this information enough with clients. I really like the 5-step process – great advice. I love the information you are providing. Thanks, Michael, for such great insight into the recruitment world. I am really finding it helpful, and have already recommended your blog to a couple of my friends. I am a fresh graduate looking for a job, and would love to have more tips for the recent graduate. I’ve actually already written a blog article with advice aimed specifically at recent graduates. You might want to check out “Advice for Recent Grads and Career-Changers.” Hope this is also helpful! That is, indeed, a simple plan … but it will only work if you are already connected (through LinkedIn or otherwise) to the people who work for the companies you are targeting — and those companies also happen to be advertising openings in your niche. Unfortunately, most people are not so well connected, and the jobs they are seeking are not always posted or even open. 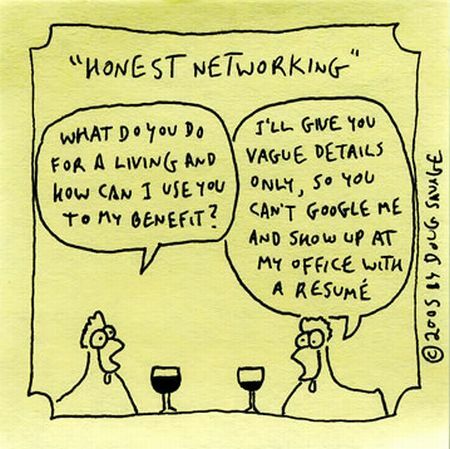 The kind of networking I am suggesting goes beyond existing connections, and seeks to uncover jobs that might not be advertised.